Our goal for the day was Gooseberry Falls State Park but it was such a beautiful day we decided to continue on to Split Rock. I hopped to get some shots of the Lighthouse with lots of ice in the foreground but it looked like a beautiful summer day. More Photos from Split Rock can be found on my website. There were just a few pockets of ice on the shore. This is how desperate I was to get some ice shots. From Two Harbors we drove up to Split Rock Lighthouse State Park. I had expected to see more ice because there were some nice ice storms in November but the ice was mostly gone. 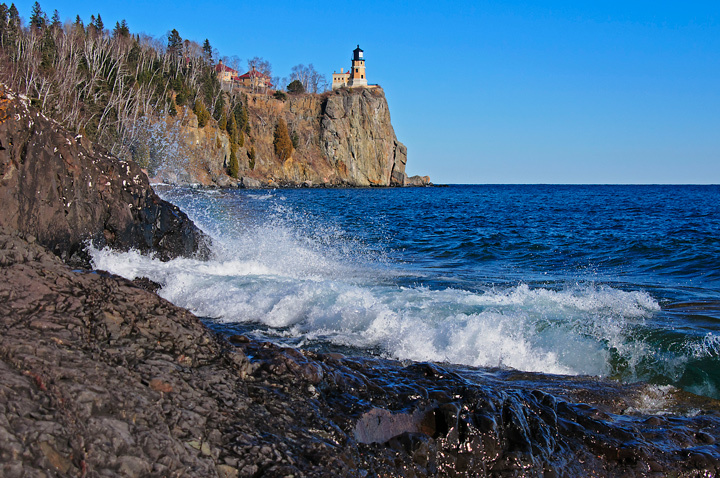 More photos of Split Rock Lighthouse State Park can be found on my website. It was a dreary day at Split Rock Lighthouse. There was a little ice and the waves were starting to increase in size when we arrived at the park. We drove up to Split Rock Lighthouse for the 40th anniversary celebration of the sinking of the Edmund Fitzgerald. Every year the lighthouse holds a program and then at sunset turns on the light. We arrived about two hours before sunset and were lucky to get the last parking spot in the most distant parking lot. We spent the first hour walking along the shore toward the Lighthouse. The late afternoon light was beautiful on the cliffs below the lighthouse. As the evening wore on more clouds came in making for a beautiful sunset. We stood on the beach for the last hour waiting for the light to be turned on. There were quite a few other photographers around. Fortunately it was an unseasonably warm night for the event. After a stop at Grand Marais for lunch we headed back to Duluth. On the way we noticed some interesting clouds as we neared Split Rock Lighthouse so we drove in to take a few photos. When we reached the beach we could see it was raining out in the lake. Just as we were leaving it started raining at the Lighthouse. 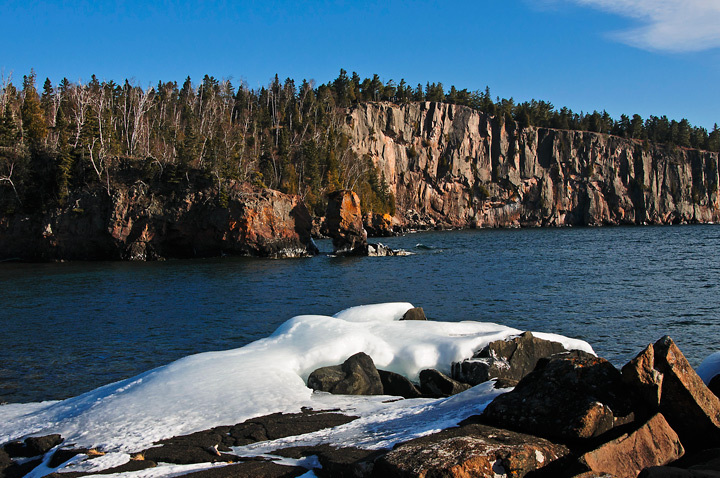 This was the first park we stopped at on our North Shore journey and the last stop before we headed back to Duluth. When we arrived we hiked out to the Beach to Photograph the Lighthouse . 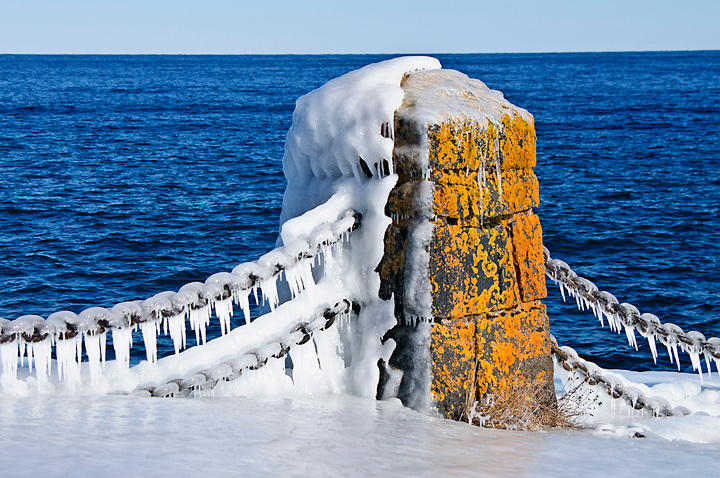 After photographing the Lighthouse we walked along the beach looking at the ice formations. After walking the beach we drove down the the Split Rock River Parking lot and hiked to Split Rock Falls. For some reason we remembered that it was a long hike but it turned out to be only a mile round trip. Last week we drove up to Split Rock Lighthouse. Once we were past Brighton Beach we found very little ice on the lake. At Split Rock there was quite a bit of ice on Little Two Harbors. It was apparently firm because some people were walking from the mainland to Ellingson Island. This past week I became so bored with the lack of winter around here I decided to take a road trip to Grand Marais, Minnesota with stops in Northern Wisconsin and along the Minnesota North Shore. I hadn’t planned to stop at Amnicon Falls State Park on the way up but there had been a little snow the day before so I thought I would give it a try. There was not a lot going on. It was fairly typical for this time of year although there was not much snow and less ice than normal because of the drought conditions. I already had better photographs of the falls so I didn’t stay long. 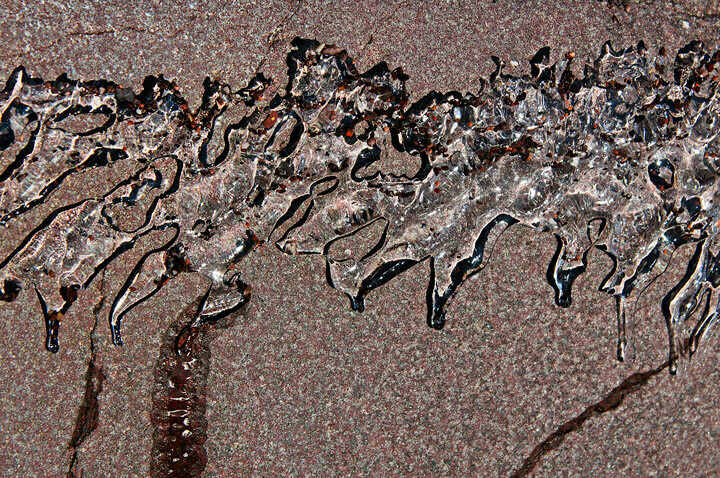 I did take a photograph of this interesting ice formation on the river above the upper falls. I’ve seen this before on the Amnicon River but don’t know what causes it. 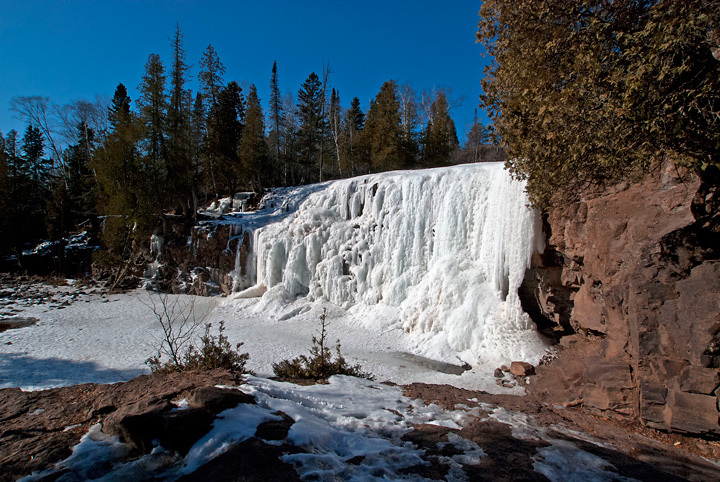 The next stop was Gooseberry Falls State Park. I drove down to Lake Superior see if there was any ice. There were some nice waves and the waves were high enough that they created a little ice at the top of the cliffs. However, the lake was ice free and a deep blue color that matched the deep blue in the sky. I then drove back to the park visitors Center. The highlight of this visit was seeing a Mink at the upper falls. 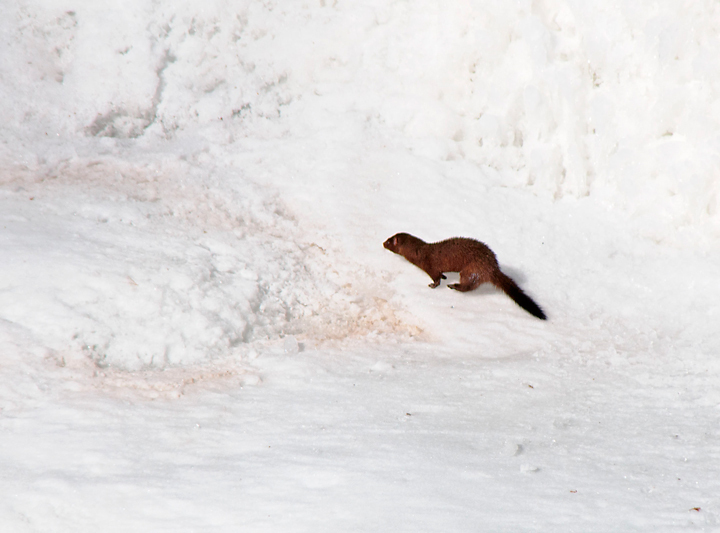 As I walked up to the falls the mink was running along the ice on the river. He saw me and stopped by the only hole in the ice. Just as I was about to photograph him he dove into the hole. I took a few shots of the upper falls and then stopped to tell a couple of other folks about the Mink. Just then he popped out of the water and headed for the upper falls. We watched as he ran all over the face of the falls. It looked like he was debating diving into the turbulent waters below the falls but finally decided against it and ran over the top of the falls. The next stop was Split Rock Lighthouse. It was a beautiful day but there was not a lot of snow or ice. I took a few photos of the waves crashing against the barren shore with the lighthouse in the background. 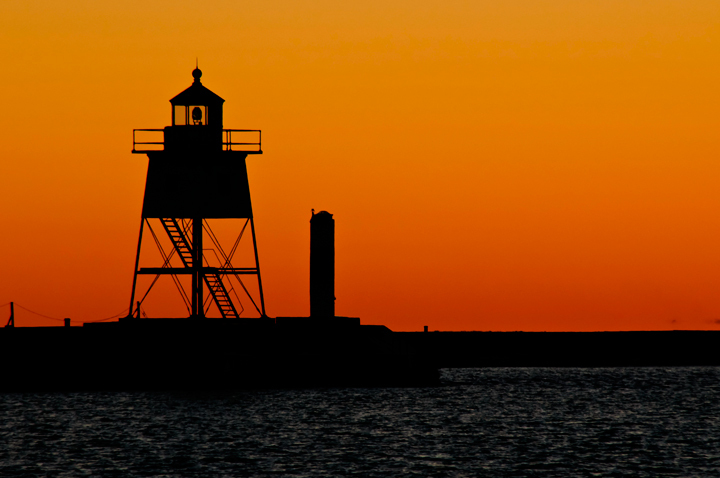 I reached Grand Marais late in the day and put on some warm clothes and went out to shoot the sunset. It wasn’t anything spectacular but I did get a nice shot of the lighthouses with the sunset in the background. The next morning I was debating whether to get up for a sunrise shot. I looked out the window and the sunrise looked promising so I headed out. there were some great clouds over the lake making for an interesting sunrise. It was really cold out. The temperature was only about 9 degrees but the wind had the flags at the Coast Guard Station blowing straight out. It made it miserable to take the gloves off for a shot. I think it was worth it though. Later in the morning I stopped at Tettegouche State Park. I walked down to the lake to take some photos of ice on the rocks along the shore. I particularly liked this shot of some ice melting on a large rock. It was a beautiful day. The sun was out and the wind had died down so I decided to walk out to Shovel Point. The trail for the most part was clear but there were enough icy spots that I wore my ice cleats. At my age I don’t need to take a fall on the ice. My last stop was at Gooseberry Falls. On the way up I didn’t photograph the lower falls because I was too lazy to put my ice cleats on and the trails were really icy. This time I put them on and was able to walk out onto the ice and take a few photos. The drought has resulted in low water levels and as a result the ice formations are not as spectacular as I’ve seen in the past. There was almost no snow along the North Shore. I saw very few snowmobiles on the road. Apparently there was a little more snow inland but the drought from last summer has carried over to this winter. I was also disappointed at the lack of ice. There was some in Duluth Harbor but I was surprised that there wasn’t any ice in the harbor at Grand Marais. It was a stretch to find even small patches of it along the shore.